Replace worn unsafe bleachers with modern aluminum bleachers. But, there still might be some interest in the old wood for furniture and paneling. 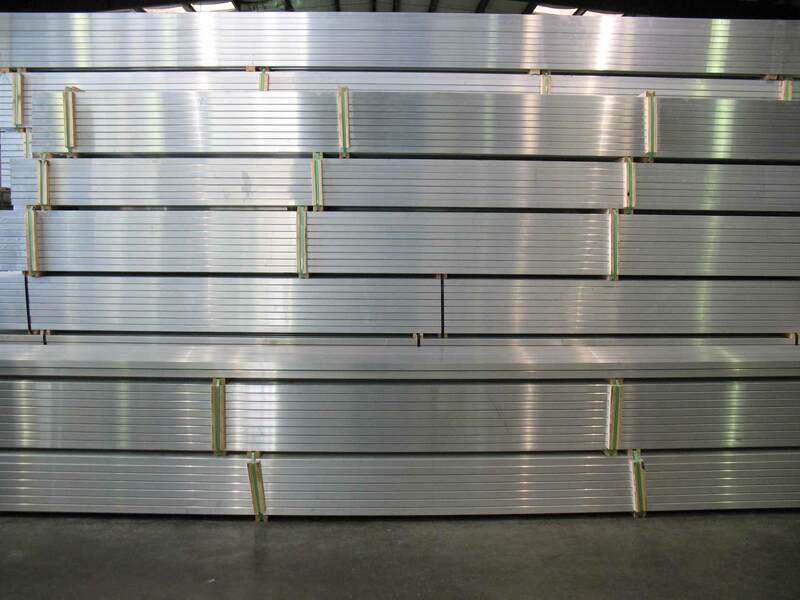 Aluminum bleachers are now the standard for safety and durability. But if your facility still has wooden bleachers, there still might be a use for them. It’s true that those old, outdated, and possibly even dangerous wooden bleachers are experiencing a resurgence. But not as the preferred, outdoor seating structure that was the standard up until the mid-1960s. Since then, wooden bleachers have been going the way of the dinosaur, being replaced by the safety, easy maintenance, and superior economics of aluminum bleachers. But using reclaimed and repurposed wood is a hot trend in home and industrial design and décor, and the supplies needed may be right under your feet, or more specifically, under your sitter-downer. And sometimes even both. So now may be the time to start thinking about replacing any wooden bleachers that still grace your stadiums or multi-use spaces, while the market for the old wood is active. It’s not a guarantee, but there’s never been a better time to try and salvage some type of use out of those old, wooden bleacher planks. In 2012, the University of Wisconsin-Oshkosh, decided to upgrade their stadium, the Kolf Sports Center, which included replacing their old, outdated and deteriorating wooden bleachers with new aluminum bleachers. Slated for a local landfill, the wood from those old bleachers got a reprieve when a wood floor vendor was asked about his supply of reclaimed wood for use in the Wisconsin Athletic Club, located in Menomonee Falls. The idea of the old bleacher wood came up and sparked an idea. Let’s just say, those old wooden bleachers have a second life every bit as dramatic and memory filled as they did for those hundreds of thousands of people that previously used them for sporting events, graduation ceremonies, and concerts. The recycled wood from the old bleachers now form the floors for the Wisconsin Athletic Club’s Mind Body Studio and their Cycle Studio, as well as artwork and shelving for the Club’s hallways, pub, fitness center, locker rooms, and offices. Although the integration of the old wood in the Club’s décor is attractive, Chez Misko, the COO of the club said “What I really love about it is the story behind the bleachers continues now at our facility because the way we’ve reclaimed and repurposed everything gives people something really to connect with. There’s a certain warmth in having the wood throughout the facility”. The folks over at Notre Dame took another route with their old, storied wooden bleachers. Rather than have someone else repurpose their wooden bleacher planks, the school decided to take things into their own hands, literally. They offered their fans the chance to own a piece of Notre Dame history for their own home. Using the actual wooden bleacher planks from the stadium, they are creating treasures and keepsakes for fans desperate to hold on to a piece of the rich history represented by those old wooden bleachers. Whatever old bleacher wood remained is being offered up to the fans in the way of memorial keepsakes for their own homes. They’re being made into single or double stadium bench seats or as memorial shadowboxes to hold personal treasures. The old, worn bleachers will be enjoyed in a second life, memorializing the history of the stadium and the memories made there. Not everyone is so lucky though. The reality of wooden bleachers is that they’ve been around for decades, and if they haven’t been maintained properly, those wooden planks can be beyond repurposing. After all, that is one of the reasons that wooden bleachers fell out of favor and are smartly being replaced by aluminum bleachers. Back in the 1970s, Bonners Ferry High School, Bonners Ferry, Idaho, was built using included wooden bleachers in the Valley View Gym. As fundraisers and donation requests have been going on to replace their old wooden bleachers with new, safe, and code compliant aluminum bleachers, the school was hopeful that they would be able to recoup some money from their old wooden bleacher planks. But the estimates they received were disheartening as their wooden bleachers were considered beyond their usefulness. Consequently, their wooden bleacher planks will be offered to the highest bidder. Likewise, Edmonds-Woodway High School, Edmonds, Washington, finally agreed that their old stadium, considered a national landmark, was beyond its use. It was scheduled to be demolished to make space for a new 8-acre destination, named Civic Park. The hopes were to recycle the wood from the old, wooden bleachers, using all or at least some of the wood around and within the new park. But those hopes were quickly snuffed out when an examination of the wooden bleacher planks revealed that the wood was unusable due to insect damage, something that new aluminum bleachers will never have to worry about. So all of those memories and notes in history will likely be put through a wood chipper or taken to the local landfill. What was once a national landmark is reduced to a decaying and dying structure. But perhaps the most creative use of old wooden bleacher planks was performed in Junction City KS, at Jefferson High School. Rather than throwing the old wood away or just tossing them in a landfill, the school started repurposing some of the bleachers into benches, starting with a bench that is in the school’s main entryway as you walk in on your way to the office. The bench serves a purpose and still bears the original seat number from the old bleachers. That little, but unique project sparked other ideas for benches in places that were prone to having students standing and waiting or sitting on the floor if they didn’t want to stand for lengths of time. The opportunity wasn’t lost on the school administrators, who immediately charged the students in the construction classes with the task of building these benches out of reclaimed wooden bleacher planks, described as old wood of incredible quality. Bench designs were researched and chosen, and plans were used for cutting the pieces needed out of those old bleacher boards. When the bench was completed, it was indeed out of the school’s old bleachers, but the finish was restored, and with the use of a borrowed wood engraver, the image of the school’s mascot was laser-engraved on the bench that now greets visitors and students at the entrance to the school. The bench was also outfitted with new numbers along the front, mimicking the original numbers of the old bleacher seats. Board members were so impressed by the final product that plans for more benches were made for the purpose of making them available to alumni and as a way to raise funds for the school. Making old things new again, with new purpose. Wooden bleachers are disappearing – being replaced with safer, more economical, and easier to maintain code-compliant aluminum bleachers, and with good reason. 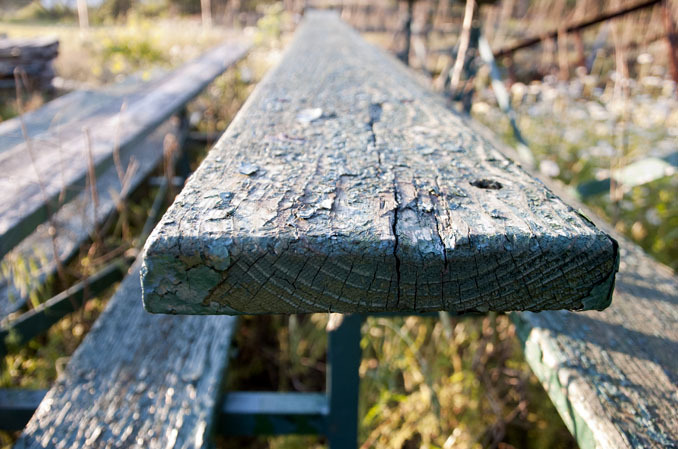 Towards the end of their useful life, wooden bleachers can be unsightly and dangerous due to rotting, splintering, and natural decay. But lucky for some schools and facilities, there just might be a way to generate revenue from their old wooden bleacher planks through the people, businesses, and organizations seeking them out for projects and designs demanding reclaimed and repurposed wood. Or perhaps you yourself can use them in an artistic way throughout your own buildings, retaining history, individual memories, and the tradition of passed down stories of great sporting or artistic events. 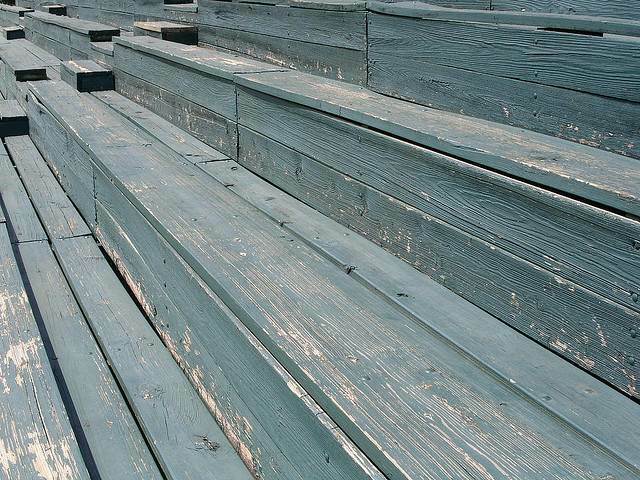 Like many items from the past century, wooden bleachers have outlived their usefulness and advances in manufacturing have created a more reliable replacement – aluminum bleachers that are safer, easier to maintain and last a long, long time.